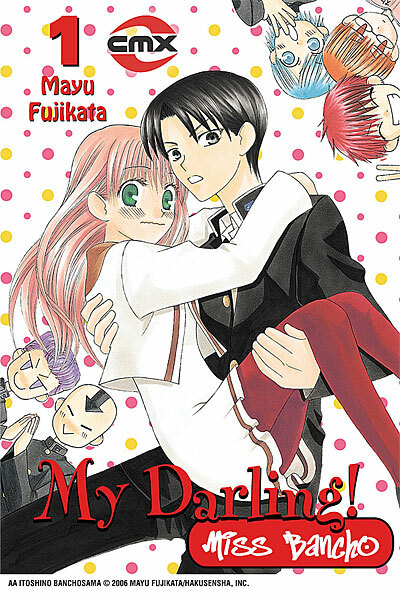 Mayu Fujikata’s My Darling! Miss Bancho (CMX) immediately reminds me of other funny, well-done comics about a girl thrust into an all-boy milieu, titles like Ai Morinaga’s My Heavenly Hockey Club (Del Rey) and Bisco Hatori’s Ouran High School Host Club (Viz). When her parents get divorced, Souka transfers to a technical school so she can start working as soon as possible and help support her mother. The school is such a strife-ridden place that all of the other girls have transferred out, leaving Souka swimming alone in a sea of testosterone and goofy gang violence. Just as she starts adapting, circumstances push her into the role of the school’s bancho, leader of all of its warring forces. Goofy as this sounds, Fujikata plays fair with the details of the plot. Souka isn’t aggressive, but she’ll stand up for herself and her friends, so her ascent in the school’s power structure is silly but not implausible. It doesn’t stretch suspension of belief to the breaking point any more than the general premise itself does. The characters are generally charming, from sweetly feisty Souka to her love interest, the formidable, strangely maternal Yuuji Katou. Fujikata gives her characters the right kind of quirks that allow them to interact in fresh, funny ways, and she comes up with sturdy, comedic scenarios to showcase them, just as Morinaga and Hatori do in their titles. It’s a likeable, well-executed variation on a very common theme, and its clear-headed freshness keeps it from seeming derivative to the point of superfluous. Fujikata also gives good author’s notes in which she expresses pixilated amusement that her editor keeps letting her get away with this stuff. 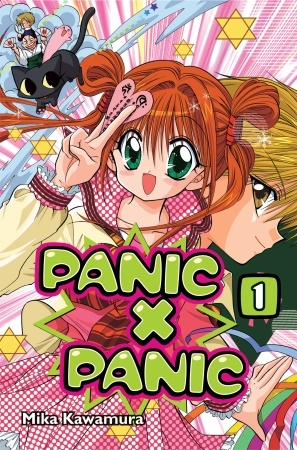 Similarities to Yellow Tanabe’s splendid Kekkaishi (Viz) abound in Mika Kawamura’s Panic x Panic (Del Rey). Both follow the adventures of squabbling neighbor kids who also happen to be able to exorcise demons. One is reluctant and relies on intuition, and the other is more diligent and by-the-book. There’s a long-standing rivalry between their families, though you suspect they kind of like each other underneath the sniping. The key difference between the two books is that Tanabe’s Kekkaishi is really good and feels fresh, and Kawamura’s Panic x Panic isn’t and doesn’t. I think it’s the relentless overlay of cuteness that Kawamura slathers on her pages. I’ve got no problem with cute in general, but there’s a certain kind of sugary adorability that I find completely resistible. Kawamura erects her very familiar framework with a style that’s (for me) too reminiscent of some of the work of Arina Tanemura – tons of bouncy hair, sheets of screen tone, hug-me-now character designs, and enough hair ribbon to fashion a sturdy noose. There’s never quite enough that’s interesting or specific to Panic x Panic to distract me from thoughts of other, better versions of the same story. You are currently browsing the The Manga Curmudgeon blog archives for the day Thursday, March 4th, 2010.